11 September 2001. It's a date etched into our memories and brings with it feelings of fear, despair and injustice at the loss of thousands of innocent lives in the US through the co-ordinated air attacks on New York, Washington and Pennsylvania. One side of the story that made far fewer headlines than the attacks, were the thousands of people that were in the air during them – en route to the States but diverted to airports in Canada. And one of the places to receive the biggest influx of unexpected overseas passengers was the small town of Gander in Newfoundland. With nearly 7,000 people seeking shelter in this small community, Gander almost doubled in size overnight. All those people that came from away found a temporary home in Newfoundland. Language and culture barriers were broken through by the overwhelming kindness of the people of Gander opening their doors and homes to the thousands of lost, confused and scared strangers. Come From Away is the story of the flight crew, overseas travellers and townspeople coming together – and it's beautiful. Before it even opened in London I was promoting Come From Away to everyone when talking theatre based purely on this stunning performance and my love for all things Canada. And man did I get homesick for this gorgeous North American country while watching the show. The musical wonderfully captures the incredible kindness of its citizens, the quirky lilting accents, the folk music with distinct Irish and Scottish heritage, and Tim Hortons at the heart of the community. The show is Canadian through and through, co-written by Canadians Irene Sankoff and David Hein, and it really shows in the beautiful, heartfelt music and heartwarming story. It may be a stereotype to say that Canadians are the kindest of people, but they truly are and Come From Away really affirms their incredible generosity in opening their homes and hearts to the thousands of stranded people from all over the world. The musical has a relatively small cast for the West End stage, and a very simple set and staging. Yet by focusing on the experiences of selected townspeople, travellers and flight crew – fictionlised for the stage but based on some true stories like that of the first female captain of an American Airlines aircraft who was in charge of one of the diverted planes – the show becomes far bigger than that stage at the Phoenix Theatre. The incredibly talented cast take on a wealth of different roles between them, switching accents and personas in a matter of moments; it was mesmerising to watch. This is a true ensemble piece and it would be unfair to single out any actors, as they made this show so very special together. The entire cast was terrific and a delight to watch, both in the comedic scenes and poignant moments. They made me laugh and cry, occasionally even in the same scenes. What does deserve to be singled out is the wonderful soundtrack. The music was stunning throughout but songs that especially stood out were Welcome to the Rock, 28 Hours/Wherever We Are, Me and the Sky, and Finale. Each of these songs give goosebumps and linger long after seeing the show, for the best of reasons. During our performance, Come From Away received an unanimous standing ovation after a hundred uninterrupted minutes of theatrical magic, and rightfully so. This show and story are something very, very special. It brings joy and hope in the darkest of times through kindness, open-mindedness, and an incredible feeling of togetherness. In 2001 Gander became an unexpected home to 7,000 stranded people and the musical has the exact same effect on the audience watching it play out on stage. It's magical, and I cannot wait to visit the island again very soon. 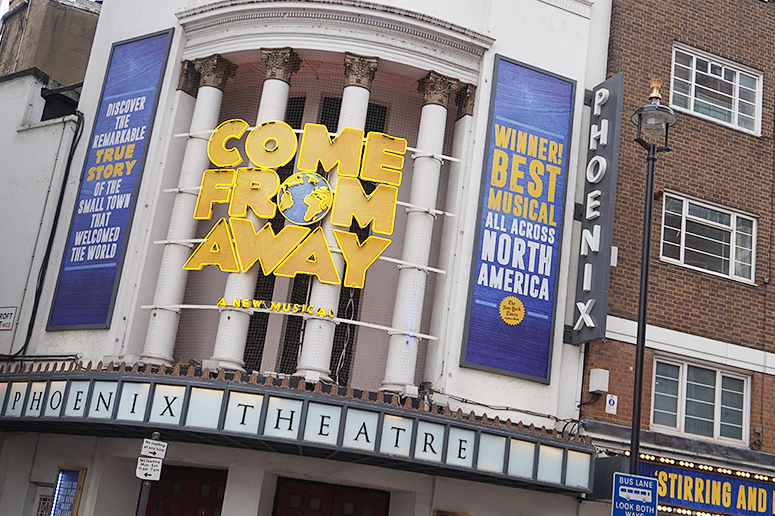 Come From Away at the Phoenix Theatre is currently taking bookings until 14 September 2018. Get your tickets here.